The epic 30th edition of Univision’s “Premio Lo Nuestro a la Música Latina” celebrated the best of Latin music in a spectacle of color and sound that gathered the best artists of all time. International icons Gloria and Emilio Estefan received a special recognition for their pioneering work as Latin music ambassadors and inspiration for new generations of artists. Unlike previous galas, #PLN30 focused on commemoration rather than competition and featured an extraordinary array of talent onstage of the longest-running awards show for the Hispanic community in the U.S. Among the performances of the night were Daddy Yankee , Jhonny Ventura, Laura Pausini, Milly Quezada, Pepe Aguilar, Pitbull, Víctor Manuelle, and Bad Bunny opening the show with a production by Sergio George; Leslie Grace , Il Volo and Víctor Manuelle paying tribute to the Estefans; Banda MS honoring Joan Sebastián, and David Bisbal with a rendition of José José’s “El Triste” that gave you goose bumps. Silvestre Dangond also went on stage taking on Lalo Rodríguez’s “Ven Devórame Otra Vez,” which was the first song to ever win a Premio Lo Nuestro in the inaugural show; Wisin y Yandel returned; Son By Four’s Angel López sang “A Puro Dolor” with Piso 21, and Olga Tañón gathered some of the fiercest ladies in music: Natalia Jiménez, Victoria “La Mala” and Natti Natasha to perform some of her most famous hits as everyone celebrated that Tañón is the artist that has won the most Premios Lo Nuestro in the history of the show. But one performance that left audiences feeling nostalgic was when Ricardo Montaner took the stage to sing “Tan Enamorados,” the song he performed on the first Premio Lo Nuestro back in 1989. As soon as he reminded everyone why he is such a timeless artist, the music changed to “Será,” another hit that became popular in 1991. 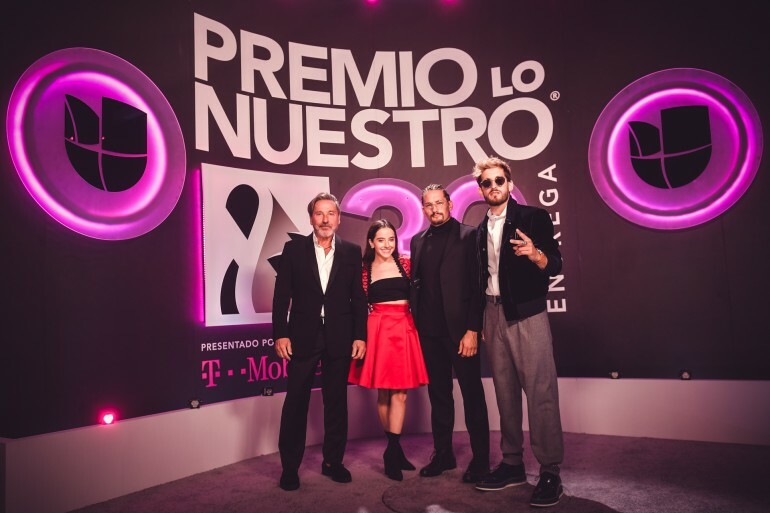 But before he started singing, Montaner introduced two of his sons, Mau y Ricky, who are up and coming performers with hits such as “Mi Mala” and “Voy Que Quemo” and with a proven track record as composers, to sing with him. As if the moment wasn’t emotional enough seeing two generations of Montaners on stage displaying their talent and charisma, there was room for a third song, “La Cima del Cielo,” originally released in 1999, and now performed by Montaner’s daughter, Evaluna Montaner, who joined her father and brothers to add the cherry on top. The talented family took us on a musical journey through some of Ricardo Montaner’s best hits, igniting a lot of feelings and memories for the generations who grew up listening to this music and definitely relate the songs to a particular moment in their lives. Although Ricardo Montaner doesn’t have retirement on his plans, in this performance it was as if he validated his children’s careers and passed the torch out to them. As an audience member, it was a beautiful moment to watch, as you could feel the love and endearment emanating from this proud father.